Raspberry mousse cups: creamy and tasty, perfect for dessert! 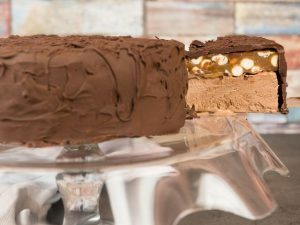 This dessert is wonderful and mouthwatering. A divine and fresh cup dessert, try and you'll never leave it. 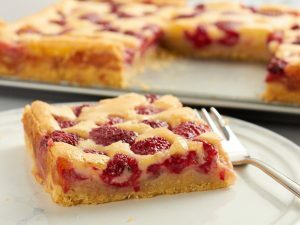 In a medium saucepan, cook the raspberries with sugar, then strain through sieve, pushing on the back with a spatula, and mix with lemon juice and gelatin. Cook for 5 minutes more on a low heat. Whip the cream with powdered sugar, divide cream mixture into 2 parts and mix one part of cream with raspberry sauce. Fill two pastry bags with whipped cream and raspberry whipped cream. Simple Syrup: mix together the ingredients and dip lady fingers. 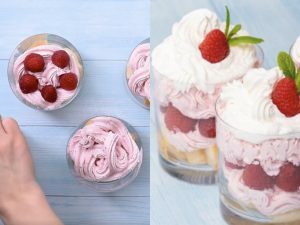 Put the biscuits on the bottom of the glass, cover with raspberry whipped cream, layer fresh raspberries, and cover them with raspberry cream. Decorate with whipped cream, fresh raspberry and mint.